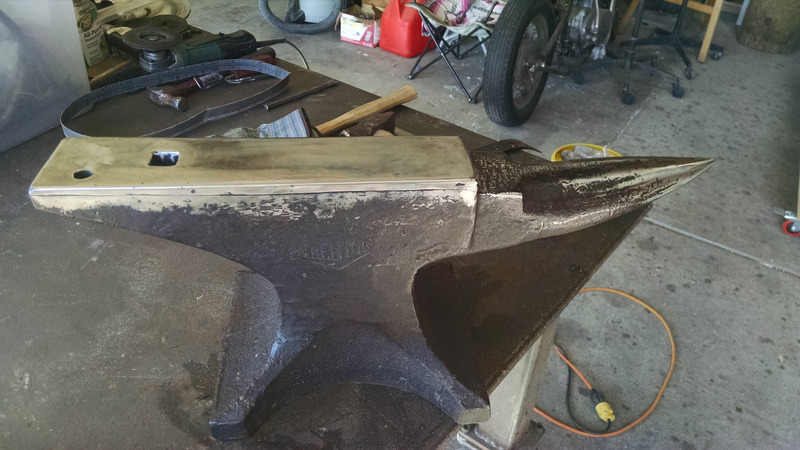 Restoring a 1860's vintage 147 lbs Fisher Anvil - The Iron Forge Fire Blackmithing Forum. This Fisher anvil was the first anvil I've ever purchased. I got it off eBay from a local seller. Problem was the seller didn't represent the condition accurately in the post. Plus the seller wasn't present at the time designated after an agreed time and location for me to pick it up. Then the seller offered to drop it off. That's when I discovered pocs under the plate steel that would have prevented the sell in the first place. However, I was also glad to finally get the anvil so I just went with it. I'll take my lumps; part of the learning curve. So there're several topics of discussion in the first two sentences of this post. Restoring and buying online. 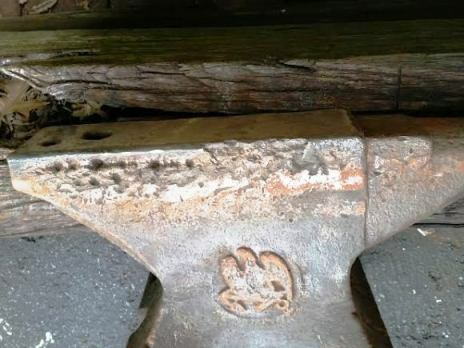 We'll focus this post on the restoring and repair of this anvil. Many folks suggested to use it as is. On the other hand I feel strong about properly maintained tools. And the idea my luck was usually bad luck would have a piece break and ruin the anvil further plus injury me at the same time. That's my kind of luck. So being prudent I have decided to repair the pocs the best I can. My original post for help on anvil restoration netted me an article on the proper way to make such a repair. This is what I'll follow the best I can. You can see after a light grinding that the pocs that need attention are well defined. As well as the edge that will get some fill. Hank, don't weld on that anvil! It has a cast iron body with a tool steel top. If you weld on the body it could cause it to crack. Welding on the top will destroy the temper around the weld zone (and will probably crack if you don't use the right rod). I'd rather have a hard surface with chipped edges than a soft one. This is a copy of an earlier response to a post on repairing my anvil. What are your thought on this repair advice? This process works well on wrought iron base anvils and cast iron base anvils with a good tool steel top. It was developed with the help of several metallurgists and welding engineers at Sandia National Laboratories. Grind all surfaces to be welded. Expose good, clean material. Grind through all folds or fractured chips. Chamfer any holes or severe depressions in preparation for welding. 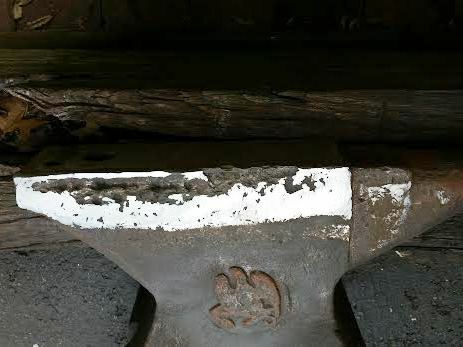 Preheat a wrought iron base anvil to 400 degrees and a cast iron base anvil to 450 degrees. The temperature can be verified with a Tempil Stick crayon available at Your welding supply store, which melts at a given temperature. (i.e., 350 degrees, 400 degrees, 450 degrees. A propane-fired weed burner works well to preheat the anvil. A wood fire call also be used if care is taken to wire brush off all carbon and smoke deposits before welding. Be careful to not overheat the anvil, particularly the heel and hardy hole area, as it's a thinner cross-section and heats faster than the more massive parts. If your anvil has a wrought iron base and the damaged area goes through the tool plate so that You have to begin the repair by welding to the wrought base material, use Stoody 2110 (or equal) 3/16" rod (DC reverse works best; however, it will run AC); Unlimited passes. Expect 45 Rockwell C as welded. When you can finish building up the repair area in no more than three passes(or layers thick), use Stoody 1105 (or equal) 1/8" rod (DC reverse, or AC); expect 50 to 52 Rockwell C as welded, which should be consistent with the original hardness of the tool plate. The Stoody 1105 is a particularly good match for the W-1 tool steel tops of most anvils and is designed to be impact resistant. When welding to a cast iron base anvil and on to the cast iron base, a layer of NI rod (high nickel) must be Put down first. Build Lip over the NI rod with Stoody 2110 (or equal); Unlimited passes (DC reverse); expect 45 Rockwell as welded. The last three passes(or layers thick), use Stoody 1105 (or equal) 1/8" rod (DC reverse); expect 50 to 52 Rockwell C as welded if you don't exceed three passes thick. Cast steel anvils repair well using the combination of the Stoody 2110 and the Stoody 1105 (last three passes). Repair to the horn of a wrought iron base anvil can be accomplished with 6010 welding rod as needed. If the point of the horn is blunted or slightly broken off, we usually Put the end of the horn in a coal forge, heat it to bright orange and forge it out to the desired shape using a 12-lb. sledge to back it up and a 2-lb. rounding hammer on top. Repairs to the horn of cast iron anvils is usually done by welding with the NI rod and grinding. If the area around the hardy hole or pritchel hole needs repair, weld using the above detailed process; however, inserting a chill (or form) made of 1/16" sheet copper into the respective hole before welding will save you a lot of grinding and filing to true up the hole. These hard surfacing rods used here to repair anvils are quite gravity sensitive during the welding process. If you can lean the anvil at 445 degrees against a cinder block while welding on the edges, you will have more of the somewhat expensive welding rod on the anvil and less on the floor. After all welding repair is complete and you are sure that there is sufficient buildup to allow for grinding to the desired finish (check with a straightedge), post heat back to 400 degrees or verify with the Tempil Stick that the anvil is still that hot from welding. Pack the anvil in vermiculite (crushed mica), available at most nurseries, to allow it to slow cool for a minimum of eight hours. This will minimize the potential for stress cracking from welding. Grind the anvil to the desired finish. We start the grinding process with a 24-grit cup stone on a large-body grinder It is quite aggressive at quickly removing metal. Be careful to keep it running flat (sparks coming off both sides of the cup stone). Continue the grinding process using flex back metal sanding discs, starting with 24 grit and working down to 240 grit, in five or six steps. Until now, all edges should be kept sharp and square. With 100 grit or finer sanding disc, radius the edges to your desired shapes. Near the anvil step the radii are typically ground to a 3/16" or 1/4" radius and tapering to nearly no radius at the heel of the anvil. The edge of the step and the heel are usually left rather sharp and only broken with a file. A final polish call be done with a Scotch Britedisc and you can usually see your face in the anvil top. This anvil restoration process has been used on several hundred anvils around the country with great success. Return to the Blacksmithing Articles listing page. Return to the ANVIL Online Table of Contents for April, 1998. I don't see anything that is hurting that anvil as a tool. Are there any cracks? Is the faceplate coming off? From the pic it just looks to be abused from laying on it's side for many years. While the advice on welding cast iron is sound, you are dealing with 2 types of materials that aren't normally compatible. The benefit from filling in the pits don't outweigh the risk. At best you will have a cleaned up anvil but it will be dead around the weld, the other side is a crack that will ruin the anvil as a tool. Well, I have to agree there's nothing preventing the anvil as a useful tool. That's what has me stumped. This anvil been around since the Civil War and other than the pocs is in good useable shape. So for now, I'll clean it up better and use it. If anyone has used the prescribed repairs posted above I like to hear from you on how it turned out. Good or bad. I had a cast iron anvil, it was one of those harbor freight junk ASO's. After doing a number to my elbow I set it aside. To try to make it better I used the method to weld a top on it. It worked, but it was still dead. A while later I cut the top off and started building up a top. After about 3 layers I got bored with the project and let someone have it. I might have eventually made a decent little anvil. I thought it would be funny to see a Chinese anvil with a stainless steel top. I bought a Trenton anvil that had similar problems. The Trenton I have has a hardened steel plate, just like many old anvils. It came with bad edges, some deep pock marks on the face from being used as a welding table and a washed out hardy hole. I wanted a clean face and the edges smooth for forging half on half off and making clean set downs. I found the same article you posted and got to work. I am a decent welder and knew I could restore the anvil. With hard facing rod and a temp stick, I followed the instructions and am very happy with my repairs. The face is in great shape now and the edges are radiused the way I want them. I did not notice any loss in rebound at all. Only one hairline fracture on one edge developed after the repair. Right now I am not going to worry about it. I have hit the edges a couple of times and noticed a little softness as they dented a tiny bit. However, that is a small sacrifice I am willing to live with to get the clean set downs when I am forging a set of tongs or just doing some drawing out. Over time, the welds will work harden as that is a characteristic of the welding rod I used. It's your anvil. Do with it as you please. A lot of guys have successfully repaired an anvil using Gunther and Schuler's article and are much happier with their anvils now. However, some guys are not skilled enough as a welder to accomplish the job and would probably ruin the anvil, so just keep in mind the advice you have received. Sometimes, It is just better to use what you have and you'll find it works for just about everything you need. For example, for clean set down edges, weld up a large hardy tool with tool steel that is the same width as your anvil. Put 4 different radii on it and use it when you need a good edge. It has been awhile since you started this thread. What did you do with the anvil? 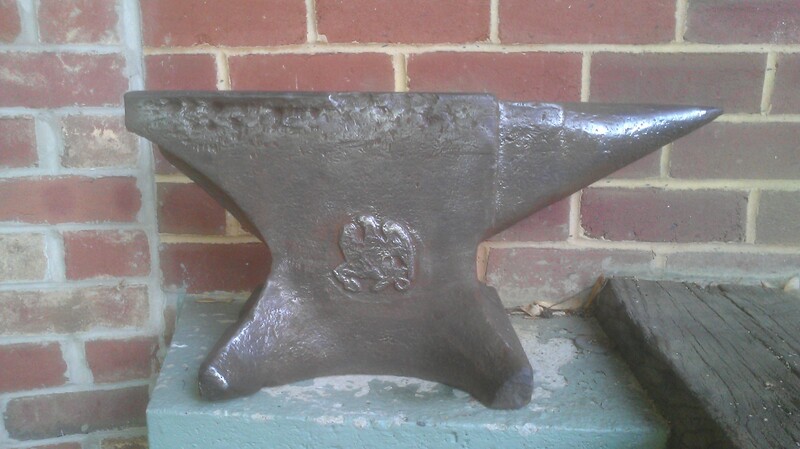 Hello Matthew, I really glad to see that you repaired your anvil and the condition similar to the one I have. I did talk to the welding supply about different rods I just haven't pulled the trigger on making the repairs . I eventually will but I'll wait till I'm more comfortable. Is there any chance you might have before and after pictures or at least after pictures you could post? Here are a couple photos of my Trenton anvil, before, during and after. It is a little more than 100lbs. The edges and pitting were not as severe as yours are. I did not do any repair to the iron body. I do know that with the correct rod, you can build up and do repair on the old iron body and then with regular rod, you can repair the face. Perhaps, just repairing the face of yours will be sufficient. I purchased a hard facing rod as recommended in the Gunther article, but have read that many repairs have been done with 7018 with great success. I am sure this isn't going to be the last anvil I repair. I got this anvil last year for $300. Right now anvil prices are crazy. There are some things I learned while doing this repair and my next repair will be better. However, I am very pleased with the repair and will have the anvil for years to come. So far it has given me many hours of useful work. Good luck on the repair to your anvil. Thanks Matthew D, Did you use a positive ground? Most of the repairs on my anvil will be the iron body. I will have one or two passes overlapping the welds from the iron body and the tools steel face. Your anvil cleaned up nice. I glad you posted. More input for failures and successes would be helpful for all. Thanks again. No, I used DC- to do the welds. I have always found that DC- flows betters into the steel and the welds aren't stacked up. Hope that helps. 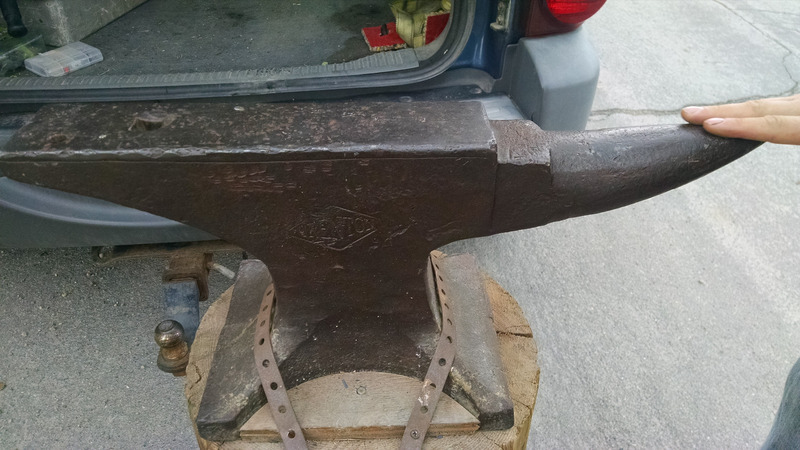 I bought a 150# cast iron anvil at an auction. The edges were chipped and I used it as is for a couple of years. I wasn't able to do some of the work I needed with a good edge so I welded up the edges on the steel plate leaving the cast iron alone. I used Hardalloy 118. http://www.hobartbrothers.com/product-details.html?name=Hardalloy%26reg%3B+118 It has worked great. It's the same rod I have used on three other anvils. Hey, bringing this topic up again. The anvil has excellent rebound, similar to a Fisher, but I can see the differences. Fishers have a MUCH thicker steel plate, while this Vulcan I have has only a 3/16" plate; I imagine this is why Vulcans are so notorious for being damaged. With so thin a hard plate, the cast iron gives way beneath. There is a lot of material gone, and no sharp edges. Right now, I'm weighing the risks of trying to repair this anvil. Concerns: It's cast iron. I have no experience welding it, but I really want to try. I have no nickel rod, but there are ways of welding cast without it. Second, I might lose the rebound in a preheat. With how much I would need to fill with steel, I would like to do a cover weld with face-hardening rod, but this still may not give it the rebound I want. Advantages: By filling with steel, in the future there could be less risk of extensive edge damage. It could be repaired to almost new condition with crisp edges. And frankly, I just really want to try it. In four words- "What if it works?" Of course, this might just be me justifying my desire of self-fulfillment, but I would like to see what you guys might say. I can post some pictures tomorrow. 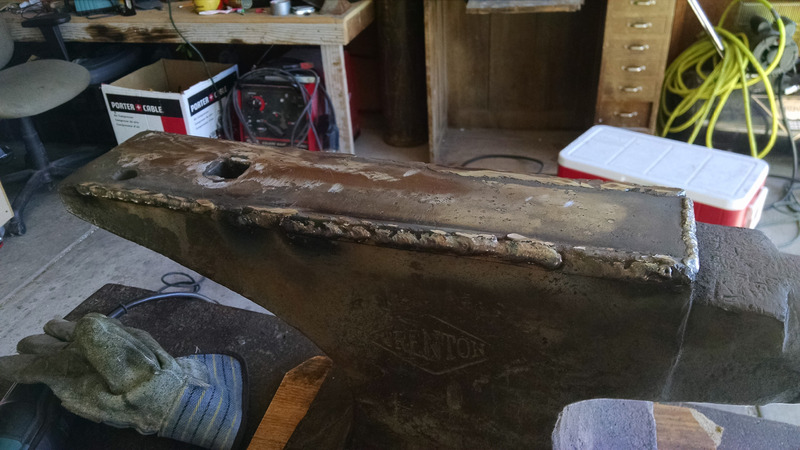 As much as I understand you desire for repairing the anvil you have, a Vulcan is probably not the best one to experiment with welding ... not to mention that crisp edges are not required. Best thing is to use as is, or sell and buy something else. Why? Vulcan have a thin faceplate so damage to the edge is bound to be on both the plate and the cast. Not an easy proposition for a weld. Crisp edges? Not required for blacksmithing, sure they look nice. For example that Trenton above ... when the welding job seems to have worked out OK, it was completely unnecessary and the anvil was perfectly usable as it was. There is nothing you couldn't do before welding that you can now do after welding, and the value of the tool has diminished and not increased. Having said that, everyone is entitled to fix, weld, grind or do what they please with their tool, I am not advocating that blacksmith become some sort of de-facto museum curators. Rob Gunther's method of repair for both cast and wrought body anvils is top notch. Our tech today allows for us to do things impossible years ago. And it means your anvil just may hit the next hundred years. Rob and his two sons live in Albuquerque, NM and I'm sure, would answer any needed questions. His two sons are right good Smith's as well. As bad as Hank's edges were, I would rebuild them to sharp, then bevel from the cut plate to about center of the "sweet spot" or slightly more. You just can't beat those sharp edges for cutting off half inch and smaller stock and not bothering with a cut off hardy. Amongst other things. I too rebuilt my Trenton years ago. Just before Rob finished his research and experiments. I used 7018 and it held up well for about 20 years. Over the last 10 it has "moved" towards the edges and my low spot is back and the off side edge, most used, have rolled over. No cracks or chips. A fix is in the near future and I will follow Rob's method. Friends who a bit later used studie rod, are still are going strong. Thanks for the input Anvil. I need to locate a stick welder to use. I have a mig here at home.